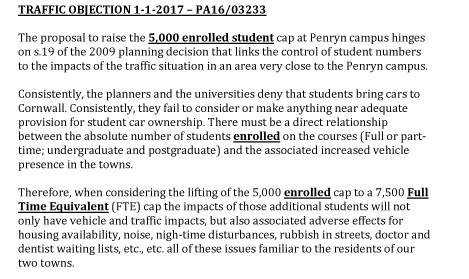 At the formation of the Save Our Falmouth Group in March 2016, Councillor David Saunby advised us of the projected student growth in Falmouth and Penryn and the impending application to allow the increase of an additional 2500 students at Tremough Campus. 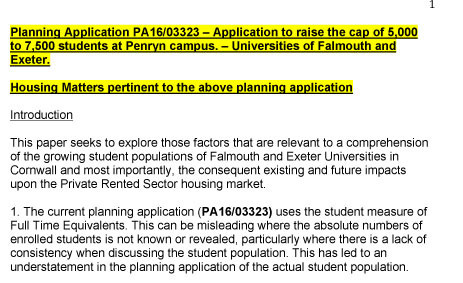 So, Tremough Campus is not in Falmouth, but is having an effect on it, the Purpose Built Student Accommodation planning proposals would not be submitted if the Uni provided it's own accommodation successfully. 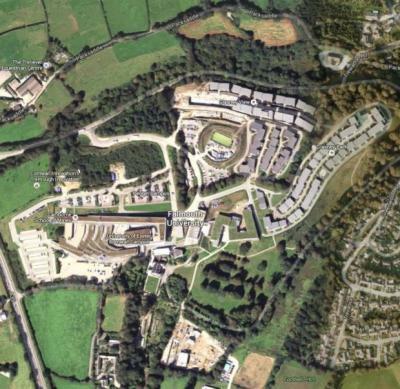 The planning application was considered at the Cornwall Council Strategic Planning Commitee Meeting on 5th January. Item 5.1 on the agenda. Please view the webcast of this meeting, link below. The agenda and reports can also be seen - see links below. Please watch the webcast: this starts at 4 mins in, and finishes with voting at 1 hour 56 mins. There were 8 in favour and 7 against, with 1 who abstained. Link: Strategic Planning Meeting 2nd March, Reports Pack File: Agenda 5.1 Page 14 - 42. How will this planning application effect Penryn and Falmouth. Will the benefits outway the negative effects? What are your concerns? Housing, Parking, Traffic, Environmental, Community Balance? To be able to make an informed decision it is imperitive to know the facts. But what are they? Reports etc. have been added to this planning application through the year, but should this application be decided on facts and figures supplied by the applicant? (see the related documents tab, and click on the view associated documents to view). Should independent analysis be used on such an important decision?